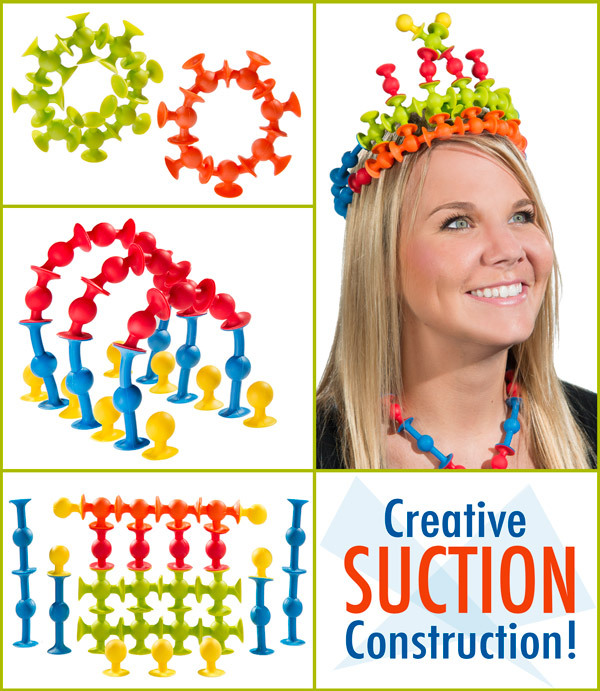 Mini Squigz: Miniature suction cup construction set. 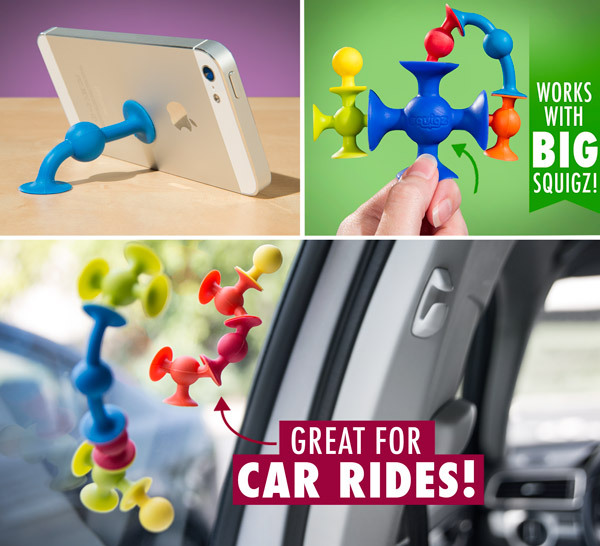 Squigz are tiny silicone shapes that stick together thanks to their integrated suction cups. 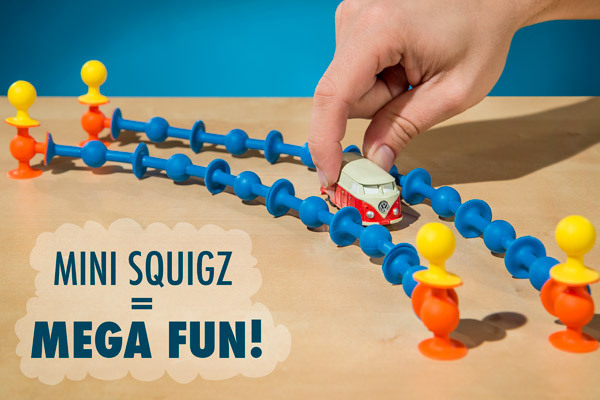 They’re a whole lot of fun to play with, and now Mini Squigz come in sets of 75, so you can play small but build big. Just like regular Squigz, each flexible piece has a suction cup that sticks to other suction cups or to flat surfaces. 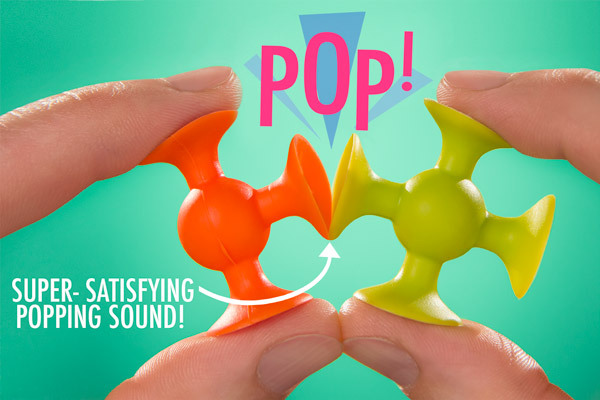 The squishy material makes Mini Squigz ultra-gratifying to stick together, pull apart with a satisfying “pop”, and combine together into complex shapes. 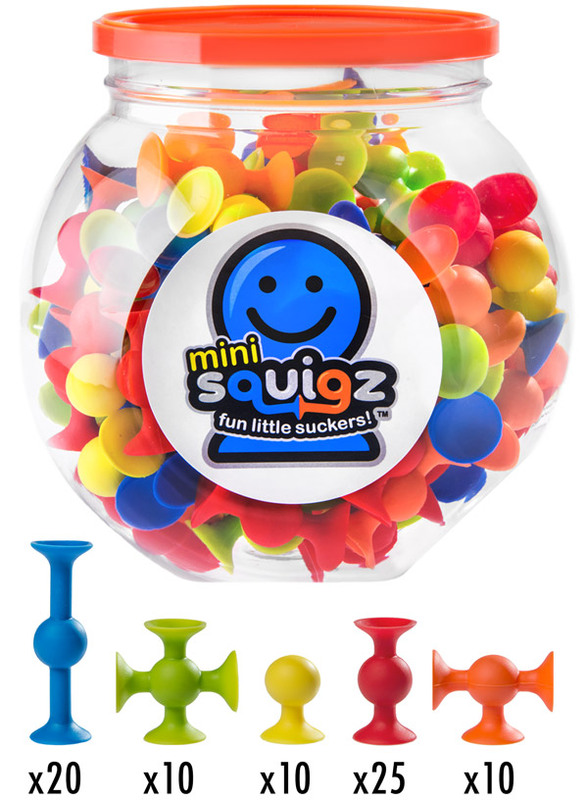 With 75 pieces in five different shapes, chances are, you won’t be putting Mini Squigz down any time soon. Little suction cups are enormously fun! Despite their tiny size, Mini Squigz are mighty fun. Stick them together or to a surface to make something you’ve planned or freeform build and see where the suction cups take you. With 75 pieces, their small size won’t stop you from building big structures! How do they pack so much fun in there? Yes, that adorable VW Bus Keychain Light is also available for purchase! With seventy-five pieces in five different shapes, Mini Squigz are a building set that opens a world of possibilities. When you give a kid Squigz, you’re not giving them just one thing to build. You’re giving them a chance to express their creativity while developing motor skills and having fun all at the same time. What will you make with Mini Squigz? Be warned; Mini Squigz are dangerously addictive. There’s just something about the sensation and sound you get when pulling Squigz apart that makes you want to do it over and over again. These are a children’s toy, but adults have a hard time letting them go. The suction cups on Mini Squigz will stick to any non-porous, flat surface. Kids will have a blast sticking them to tables, counters, car windows, themselves, and big Squigz too. Step 1: Stick Mini Squigz somewhere new. Step 2: Repeat. Each Mini Squigz set comes with 75 suction cup pieces in five different shapes. Each piece is made from high-quality silicone with 1-4 suction cups attached to it. Get Mini Squigz and get busy building. Question: How do these compare to normal Squigz? Answer: Mini Squigz are 40% smaller than regular Squigz, but they’re just as fun. Both sets are solid silicone construction toys with suction cups. Question: Do they really make a sound? Answer: Yes, pulling the suction cup off a surface makes a satisfying pop that, combined with the tactile sensation of the stretchy silicone, is just plain awesome. Question: How durable are they? Can I chew on them? Answer: They’re made from solid silicone, so while it’s possible to rip or cut them with excessive force, they’re almost impossible to crush, and they clean off easily with just water. Since Squigz pose a choking hazard, you should never put them in your mouth. They're not candy. This is candy. Question: Do they leave a mark? Answer: Nope! Mini Squigz rely on a vacuum rather than sticky adhesive to stick, so they won’t leave any residue. However, if the surface you stick them to was already dusty or oily, the pressure from the Squigz might collect the grime that was already there into a circle pattern.